The Japan of anime and manga, high-tech and high-speed trains may not seem like a superstitious place. But under the skin, Japan's is an ancient and originally animist or pagan culture, in that sense much like my own country of Ireland. The native religion of Shinto has had to give up a lot of mindshare to Buddhism, Christianity, new religions and cults, and of course modern consumerism. But it retains its strong but subtle hold on the national psyche. There is no clearly defined border between superstition and religion, and they are essentially cultural cousins. A definition of superstition, such as "a belief in something not justified by reason or evidence" would certainly be some people's definition of religion. Every day Japanese people will observe one or more of the many superstitions that are ingrained into their culture. Many relate to death and funeral rites, others to major occasions like weddings, while others are just little more than old wives' tales. As the words for the number four and death are both pronounced "shi", the connection is previous obvious, though we don't have any superstitions based on such verbal similarities in English. In Japan, the number four is simply considered unlucky. So elevators might not have a button for the fourth floor (no they don't leave a big gap between the third and fifth floors, they just skip the number!) or room numbers might skip from three to five. This superstition is, for obvious reasons, most commonly observed in hospitals! In a maternity ward, the number 43 would be a major faux-pas as it can be pronounced "shi-zan", which also means still-birth. While the number four is associated with death, the number nine is pronounced "ku", the same as the word for pain or suffering. So this number is also considered unlucky. Death of course means funerals, and traditional Buddhist funerals have certain rites and rituals. The night before the funeral itself, the dead body is laid out with the head facing north. So at home many people will not sleep this way, refreed to as "kita makura". One aspect of the funeral ceremony is to stick chopsticks into a bowl of rice placed on the altar. For this reason, people will never do this at the dinner table. Another example is that bone fragments of the cremated body are passed from person to person using chopsticks before being placed in an urn. Again for this reason, when eating people never pass food from one pair of chopsticks to another. Fortune telling is big, big business in Japan. These days it's almost impossible to switch on the TV without seeing the face of Hosoki Kakuzo. This grandmother is in the Guinness Book of Records for selling the most fortune telling books in the world. Her brand of astrology has helped her sell over 100 books and make billions of yen. The fact that she's a mean-spirited, conservative old woman who's too caught up in her personality cult doesn't seemed to have harmed her popularity, particularly among young women. On a smaller scale, if you walk Japan's city streets, you might see the occasional line of people waiting to consult with a somewhat less acid-tongued palm reader. Horoscopes are often featured on morning TV shows popular with housewives and any bookstore is sure to have a wide selection of books on the subject. If you feel that maybe luck and good fortune are not on your side, your friendly neighborhood shrine call help you set the balance straight. Just cough up a few hundred yen and you'll have your very own "o-mamori", an amulet or talisman. There are separate ones for safe childbirth, safe driving, exam success and just about anything you can think of. If you're inclined to take it a bit more seriously, it is said to be connected with the particular powers of the "kami" or gods enshrined within. Made of a small piece of cloth, they contain pieces of paper or wood with prayers written on them that are said to protect you ("mamori" literally means protection). Another racket at the shrine or temple (remember, they don't pay taxes) is "omikuji". You pay your fee and pull a stick out of a box. Depending on what you select, you get a piece of paper that ranks from "daikichi" (great fortune) to "daikyo" (really bad fortune). Seal the deal by tying your paper round a tree in the grounds and your good luck will ensured or your bad luck averted. 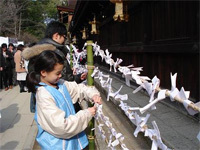 Men and women of certain ages also go to a shrine or temple to make sure they don't suffer the worst of "yakudoshi". The term refers to the ages 25 and 42 for men, 19 and 33 for women. The word "yaku" means calamity and it's thought that failure to ward off the bad luck can lead to disaster. Wearing red is also thought to help. Red is also worn at an event to celebrate a man's 60th year. Called "kanreki", it marks the fifth completion of the traditional 12-year cycle and is referred to as a kind of return to childhod or second infancy.